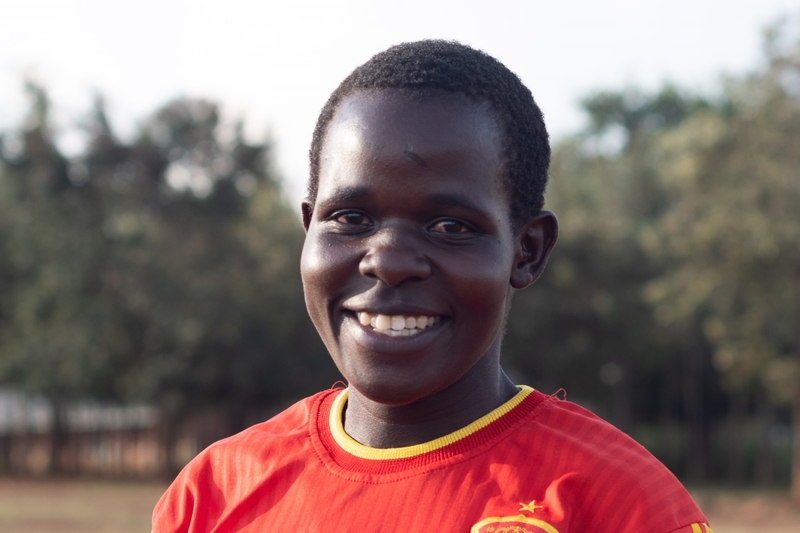 Claire is player coach for Karibuni Girls’ Football Team. She has been playing and coaching the team since March 2018. Claire is 24 years old and was born in Godbondo, a village a couple of miles away from Ndhiwa. When she was three years old, Claire moved to Nairobi to stay with her older sister as her mother was too old to take care of her. Unfortunately, Claire has suffered some barriers to playing football; “there was a time when my Dad only gave my brothers the chance to play football and I was left out.” She is also currently injured with a fractured knee, but hopes to be able to resume training in the next month. Claire feels that it is very important that girls are able to play football and gives four main reasons for this. “Firstly, younger girls who are playing good football can find sponsorship to attend schools, meaning that they can continue to receive education. Secondly, when girls see other girls playing football they are encouraged and empowered to take part themselves. Thirdly, when girls play football they do not feel as if they are left out. They feel equal to boys and gender equality is achieved.